Pound Sterling has caught a bid on data showing the UK economy grew at a robust pace in the final quarter of 2017. The ONS have released GDP data that shows the UK economy grew 0.5% in the final quarter of 2017; ahead of analyst forecasts for growth of 0.4% in the quarter. Year-on-year GDP growth read at 1.5%, better than the 1.4% that was forecast by analysts. Growth for 2017 stands at 1.8%. 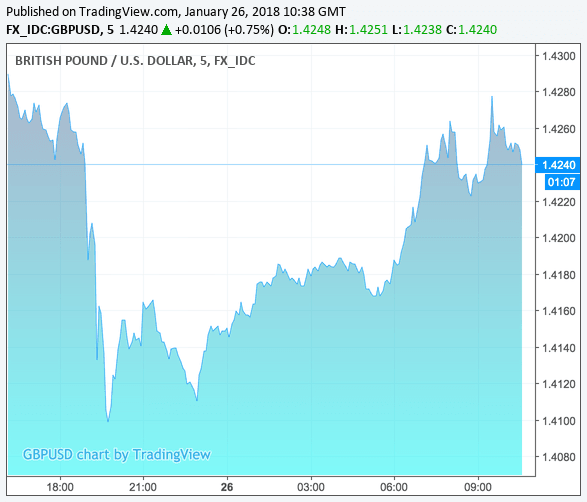 The Pound immediately went higher on the release with the Pound-to-Euro exchange rate rising up to 1.1449 having opened the day at 1.1417. The Pound-to-Dollar exchange rate leapt 0.77% to hit 1.4258 having opened the day down at 1.4150. “The general lower Dollar theme remains intact and in play across the board into London market trade with the Pound benefiting. GDP numbers are giving another push for the Pound-Dollar,” says Neil Jones, an analyst with Mizuho Bank Ltd. Above: Sterling has recovered overnight falls against the Dollar and Euro on the back of the better-than-expected data. The preliminary estimate of fourth-quarter GDP revealed that the economy picked up pace in the final three months of 2017 confirming the UK put in a better show than many economists had been anticipating. Growth for the year as a whole stands at 1.8%, barely lower than 2016’s 1.9% outturn. Looking at the details, overall industrial production growth slowed from 1.3% to 0.6%, while the construction sector’s recession intensified, with growth falling from -0.5% to -1.0%. This was offset, however, by a pick-up in growth in the more dominant services sector, from 0.4% to 0.6%. Looking ahead, most forecasters expect the economy to slow in 2018 with the consensus seeing growth down at 1.4%. “However, with inflation dropping back – easing the squeeze on households’ real incomes – investment intentions remaining strong and exporters still benefitting from a weaker Pound (against the Euro at least) and a robust global economy, we continue to think that the economy should continue to grow by about 2%,” says Hollingsworth. Analyst Samuel Tombs with Pantheon Economics reckons the course towards a summer interest rate rise at the Bank of England has been set. “The services sector drove the better-than-expected performance. The MPC will take note – expect hawkish comments in Feb Inflation Report preparing the ground for a summer rate hike,” says Tombs. We also note that the data confirms GDP per capita has increased. Arguably, this is more important than overall GDP in that GDP per capita – or per person – reflects whether the population is getting richer. This is evidence that people are likely to feel somewhat better off. Of course this must be reflected by wage increases which would arguably lag improvements in per capita GDP. This fits with the view that UK wages are likely to increase in 2018.